Wendy has been employed by the City of High Point's Parks and Recreation department since 2012 as a Program Activity Leader. With an educational background in Mental Health Studies and Psychology, Wendy has worked many years as an advocate for children with special needs and serving on committees that work for the improvement of public education for EC students. Wendy is the mother of 4 amazing children including a son with autism. "I firmly believe that all children have boundless potential if education limits are not set and opportunity for growth through new experiences and adaptive education are offered", says Wendy. Stephanie has been employed by The City of High Point's Parks and Recreation in the Special Populations department since 2006. Her responsibilities include Camp Ann, programs for children and adults who are visually impaired, Special Olympics, and the Miracle League. She is a firm believer in giving back to the community and that attitudes are the real disability. She also believes "if one person is touched by this program we have truly done our jobs". 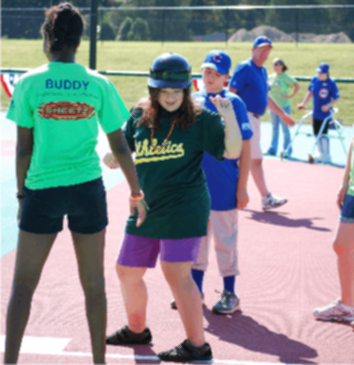 Stephanie considers it an honor to be able to work with the Miracle League of High Point. Cookie has worked for The City of High Point's Parks & Recreation Department for many years. She sometimes helps with Special Olympics and Miracle League. Her main focus and passion is working with programs for the Visually Impaired. She organizes VI bowling, Beep Ball and outings including Breakfast Club, community based programs and recreational activities.